"And in that place I saw the fountain of righteousness, which was inexhaustible, and around it were many fountains of wisdom; and all the thirsty drank of them, and were filled..."
When I first began reading The Book of Enoch the Prophet (which here refers to what is considered 1 Enoch) I wasn't quite sure what to make of it. I'd read commentaries on its text before, and had heard the opinions of scholars about its various meanings, and I had even studied the lore behind Crowleyian version of Enochian magic and the sacred hermetic interpretations of its volume. But until recently, I had never actually read the text itself. All of the scholarly material I'd studied before did very little to prepare me for the actual work itself. The text I chose was decided upon due to the fact that an introduction by R.A. Gilbert preceded its body, and I knew Gilbert's writing from other texts I'd read on Rosicrucianism. I decided to go with what seemed familiar to me, and I dove right in. I was prepared for a volume of heavy allegories, and poetic representations, but I wasn't quite prepared for spiritual "meatiness" of the text. 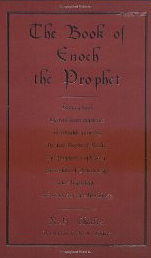 The Book of Enoch the Prophet is, in most circles, considered part of the Pseudepigrapha, that is, a part of a volume of works whose originators are represented or purported as great figures of the past, but whose real authors are at best in doubt and disputed. This fact, however, does very little to subtract from the rich magic of the text itself, and though it is verbose and very deep, it really is a fabulous study for anyone involved in occult and/or hermetic and religious studies. This particular text consists of several divisions. among which are the Book of the Watchers, referenced in Genesis as the fallen ones or the Nephilim, and is essentially a narrative of Enoch's travels in the heavens. The second division of the Book is considered to be the Book of Parables, and seems to be a continuation or perhaps even a disambiguation of the Book of the Watchers, only it includes a more in-depth look at Enoch's eschatology. The third division is the Book of the Course of the Heavenly Luminaries, which deals primarily with the sun and moon and their apparent journey through the heavens, as well as the Lunar Year. The fourth installment of the text is called The Dream Visions, and is the richest part of the text as a whole. It deals with symbolic representations of historical events within the context of a dream sequence, supposedly experienced by Enoch while in a hypnotic state or trance. This text itself ends with an installment known as The Epistle of Enoch, which appears to be, among other things, an outline for the rewards of the just versus the punishment and/or judgment of the unrighteous, as well as an exhortation from Enoch for generations that follow him. The text is a rigorous read, to be sure. It may follow that any seeking reader might want to read the installments not necessarily in sequential order, but rather as their whim leads. This may very well go against the prescribed method of study by some scholars, but to ingest the entire text sequentially is definitely a laborious undertaking. However, it does prove to be a worthwhile study, and after finished the installments, I came to understand with some surprise how it was that Crowley and his colleagues determined the book to contain within itself a secret magic, or perhaps a hidden esoteric message. Overall, the Book of Enoch (again here referring to I Enoch) - while certainly a text requiring dedicated and careful study- is also most certainly a book that must be read by any seeker or spiritualist intrigued by hermeticism or even Gnostic Christianity. While not included in the currently-defined mainstream Christian canon, it is included in the canon of the Ethiopian Orthodox Church, and is a very worthwhile and recommended read. Capricorn Soap Company on Etsy. Thank you, Diane for posting this. Christina did an fabulous job with the review and makes me more eager to jump in and read the copy I have.